from 60 pcs. 0,45 EUR ea. from 140 pcs. 0,40 EUR ea. from 360 pcs. 0,36 EUR ea. 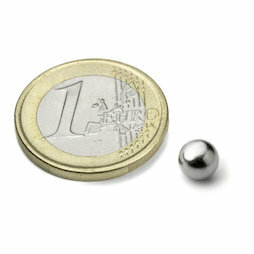 Magnet spheres with a diameter of 6 mm. You will receive a plastic tube filled with 20 pieces. Customer Kay Kublenz from Kemnath, Germany sent us this photo with the following commentary: "Normally, you cannot arrange many magnets in a block because they will reject each other. But with 288 spheres and a lot of patience, you can!"